Denmark will force refugees to give up their valuables as a kind of payment for their accommodation as they apply for asylum. The new law, expected to pass today as it has already collected a majority of parliamentary support, has prompted the UN to warn that this could „fuel fear and xenophobia“. But that’s never stopped Denmark, a thorn in the side of its more welcoming neighbours, Germany and Sweden, who have received refugees pushed out of Denmark due to its stricter asylum laws. The bill states that refugees carrying more than 10,000 Danish kroner (or about 1,340 euro) will have to forfeit any extra to pay for their accommodation. After criticism of an earlier draft of the law, refugees will no longer have to give up items of sentimental value, such as wedding rings, or items deemed essential, such as watches. Gold bullion could still be seized. This decision, which reeks of Holocaust sentiment, is only the latest in a series of attempts by Denmark’s centre-right government to roll back its obligations to refugees. Last month the prime minister, Lars Lokke Rasmussen, called for an end to the UN 1951 refugee convention, a law created in the aftermath of the Holocaust. The UN rightly condemned this idea, saying it „renounce millennia“ of human progress. But there are more terrifying aspects to the law expected to be enacted today. If the law is passed, most Syrian refugees will not be granted more than one year’s asylum, unless they can prove they are personally under threat back home. And parents who arrive without their children will have to wait at least three years before they can apply to have their family join them, adding a cruel family separation to the already harrowing effects of living through war. In 2015 Denmark accepted 20,000 asylum seekers, only 2% of the asylum seekers who arrived in Europe, and yet it is eager to prevent more from coming. Refugees on the move read the news, and decisions like this have an impact on where people aim to be resettled. 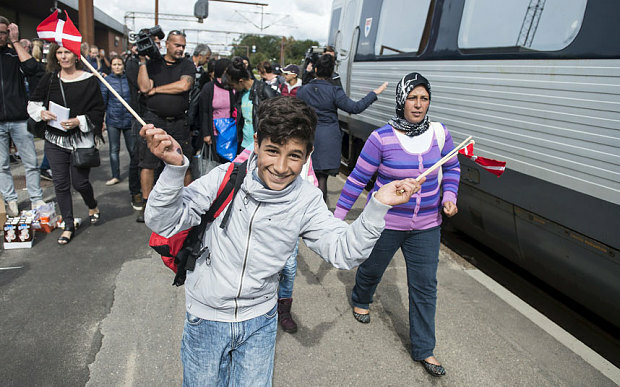 If Denmark can keep making the lives of the refugees it receives more and more difficult, it could certainly succeed in preventing more from arriving.